Today was the last day of school for the year. The first order of business was to celebrate. Thursday would typically be a school day and so tonight there is no bed time ( this is a great low cost form of celebration ). My 14 year old son had been waiting for this day for a long time. Not just because it was the last day of school but also because JOHN CARTER was finally out on DVD. So we took off for the store to get the traditional "School's Out " pizza and pick up a copy of John Carter for a mid-week family movie night. I suggested we could just rent the movie but Alex said "No, we're going to want to watch this one again and again". When John Carter was out in the movie theater's I didn't hear anything about it. I had really no idea what it was about. The only thing I knew was that it was by Disney and so I had some confidence that it would be at least OK. I had no idea that the movie was based off of a book written by Edgar Rice Burroughs. Ok so we are big Tarzan of the Apes fans. When our boys were younger we checked out the unabridged audio book version of Tarzan of the Apes for a long road trip. There were about 8 cassette tapes and it ran just about 6 hours. That was just about the length of our car trip and so if we did nothing else we would be able to make it through this one book. When we arrived at our destination later that day we had about 5 minutes left to go. As we pulled into the driveway the kids all yelled "NO - don't turn off the car! We have to hear the ending". So, we sat there in the driveway until we had heard every word on every cassette tape. We sat there for a couple more minutes just to take in the marvel that was a 6 hour book on tape. Besides that most of the kids were all strapped into car seats and so they weren't going anywhere until we let them out anyway. 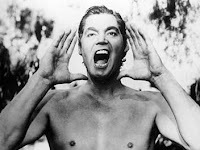 I loved watching the old reruns of Johnny Weissmuller playing Tarzan in the old black and white movies when I was a kid and I did enjoy reading the first book in the series of Tarzan books. But for some reason I didn't ever explore beyond that. I had no idea that ERB had written an entirely different series about a man transporting off to Mars. We cooked up the pizza and started the movie. The first few scenes had me a little confused but once John Carter made his way to Mars I was all in. Full Suspension of Disbelief. How was he able to breath? He just was. How was he able to understand the language - the potion one of the locals had given him (basically, magic). OK. How was it that he seemed to have super human strength - obviously the gravity on Mars enabled him to jump like that. There is a war going on over there on Mars and so there is some violence in the movie - but it is all done in Disney style that somehow makes it ok for the PG13 crowd. For the most part I think the movie would be ok for kids as young as 8 years old. The movie is even that much more interesting considering that the original book The Princess of Mars was first released in 1917. My son was absolutely right. We are going to be watching this one over and over again. And I may even have to add the book to my summer reading list.